66th Republic Day was celebrated at Desh Bhagat University with great fervour and enthusiasm. A large number of students, faculty members, staff and NSS Volunteers led by Mr. Sandeep Saggu participated in it. 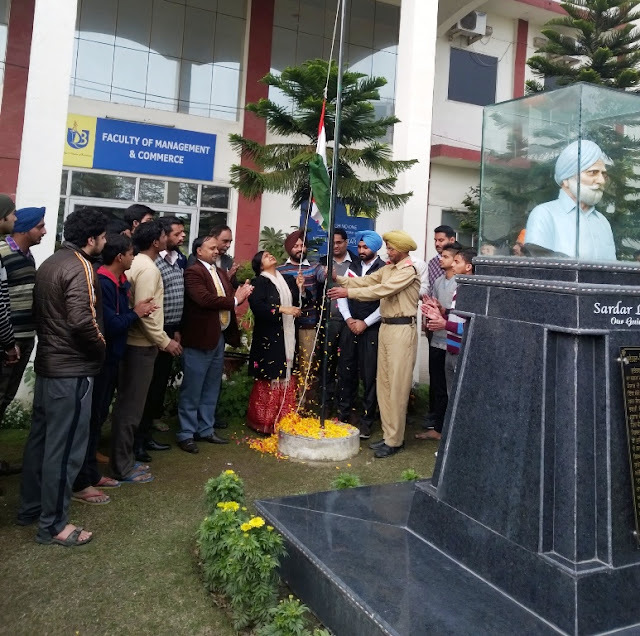 The National Flag was hoisted by Vice-Chancellor of the university Dr. Shalini Gupta. In her brief address, she felicitated the participants and emphasized that they should honour and remember those martyrs whose sacrifices brought freedom to our country and we are enjoying this freedom. She exhorted the students that they should make the spirit of cooperation, social responsibility and patriotism a part of their lives. Â Desh Bhagat University Chancellor, Dr. Zora Singh and Pro Chancellor, Tejinder Kaur observed that we don't have as much danger from outside enemies as from the inside enemies like hunger, poverty, drugs, illiteracy, casteism, regionalism, superstitions etc. We have to fight against these enemies with all our might and sincerity. The students presented a colourful cultural programme consisting of patriotic and nationalistic songs, poems etc. Sweets were also distributed on the occasion. Directors of different University Faculties and other officials of the university were also present on the occasion.